NEW ORLEANS – There’s a new leader in the clubhouse on the men’s side of the NJCAA National Team Rankings. 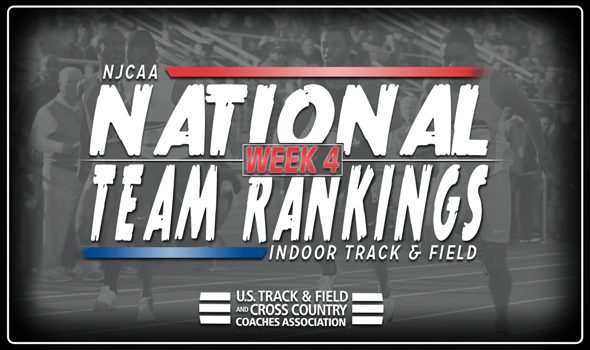 Iowa Central CC moved into the top spot ahead of Barton (Kan.) CC for the first time this season, joining its women’s program as the top teams in the NJCAA rankings, announced by the U.S. Track & Field and Cross Country Coaches Association (USTFCCCA) on Wednesday. In addition to the aforementioned change, a few more teams helped their causes in the rankings this week after having solid weekends this past weekend. The Tritons of Iowa Central CC moved to the top of the rankings on account of putting together some really strong performances at the SDSU Indoor Classic. Akeem Bradshaw’s long jump mark of 7.39m (24-3), Travis Petersen’s weight throw of 1827m (59-11¼) and the 4×800 relay team’s time of 7:44.22 all sit atop the NJCAA Descending Order List, putting them just ahead of Barton (Kan.) CC. Joining the Tritons in moving up in the rankings was Coffeyville (Kan.) CC, who returned to the top-five in fifth after slipping to sixth a week ago. Julien Gillum led the Ravens at the Indoor Gorilla Classic, posting a 1:19.59 in the 600, good for fourth on the Descending Order List. Chase Dennis, Maurice Moore and Terrell Jackson also notched top-10 Descending Order List marks in the weight throw at the same competition. South Plains (Texas) and Cloud County (Kan.) CC each stood its ground in the rankings, coming in at third and fourth, respectively, for a second-consecutive week. The Iowa Central CC women’s program welcomed its male counterparts to the top of the heap while putting on a show of its own. Adva Cohen continued her impressive rookie campaign by running a 16:16.50 in the 5000, good for first on the Descending Order List. The Tritons’ 4×800 relay squad also ran the best NJCAA time on the season at 9:15.32. All in all, Iowa Central CC hit eight top-10 Descending Order Marks at the SDSU Indoor Classic. Central Arizona made the biggest move on the week, returning to second after falling to fourth last week. Nicolee Foster led the Vaqueros at the Don Kirby Elite where she notched the top 600 mark in all of NJCAA at 1:33.58. Shawkia Iddrisu also had a great weekend, running the second-best 400 time in NJCAA this year at 55.16. The Vaqueros rise in the rankings meant two teams had to fall. New Mexico JC and South Plains (Texas) each dropped a spot to third and fourth, respectively. Barton (Kan.) CC remained in fifth, rounding out the top-five on the week.